A combined NASA and European Space Agency (ESA)-funded study has found firm evidence that nitrogen in the atmosphere of Saturn’s moon Titan originated in conditions similar to the cold birthplace of the most ancient comets, called the Oort cloud. 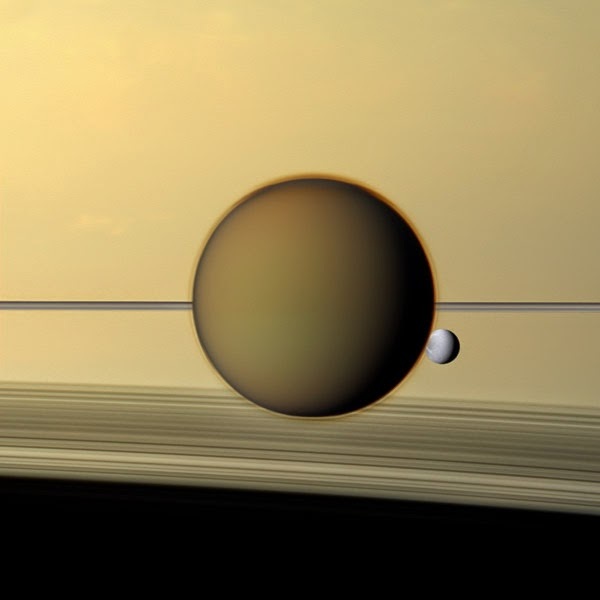 The finding rules out the possibility that Titan’s building blocks formed within the warm disk of material thought to have surrounded the infant planet Saturn during its formation. Saturn's fourth-largest moon, Dione, can be seen through the haze of the planet's largest moon, Titan, in this view of the two posing before the planet and its rings from NASA's Cassini spacecraft. Nitrogen is the main ingredient in the atmosphere of Earth, as well as on Titan, and the planet-sized moon of Saturn is frequently compared to an early version of Earth, locked in a deep freeze. The paper suggests that information about Titan’s original building blocks is still present in the icy moon’s atmosphere, allowing researchers to test different ideas about how it might have formed. Mandt and colleagues demonstrate that a particular chemical hint as to the origin of Titan’s nitrogen should be essentially the same today as when this moon formed, up to 4.6 billion years ago. That hint is the ratio of one isotope, or form, of nitrogen, called nitrogen-14, to another isotope, called nitrogen-15. The study also has implications for Earth. It supports the emerging view that ammonia ice from comets is not likely to be the primary source of Earth’s nitrogen. In the past, researchers assumed a connection between comets, Titan and Earth, and supposed the nitrogen isotope ratio in Titan’s original atmosphere was the same as that ratio is on Earth today. Measurements of the nitrogen isotope ratio at Titan by several instruments of the NASA and ESA Cassini-Huygens mission showed that this is not the case — meaning this ratio is different on Titan and Earth — while measurements of the ratio in comets have borne out their connection to Titan. The findings mean the sources of Earth’s and Titan’s nitrogen must have been different.